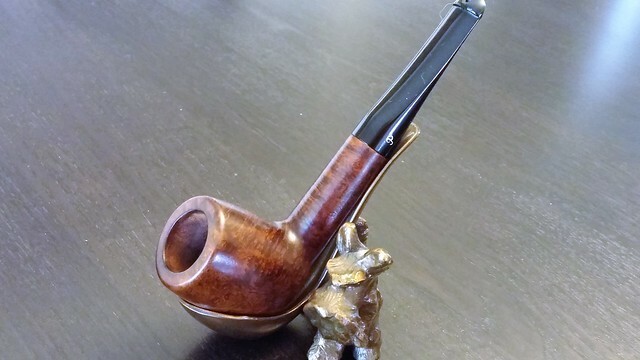 This pipe was another one sent to me by a DadsPipes reader for a bit of “spit and polish”, this one coming to me from El Paso, Texas via a VERY circuitous route – when the parcel arrived, it was marked “MISSENT TO JAMAICA”. That explains the late arrival! 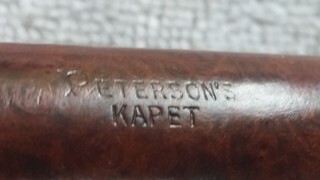 The pipe is a Republic-era Peterson, stamped “PETERSON’S” over “KAPET” on the left shank, and “MADE IN THE” over “REPUBLIC” over “OF IRELAND” on the right shank, along with a shape number, “X105”. The COM stamp was more lightly struck than the shape number, or perhaps simply more worn. 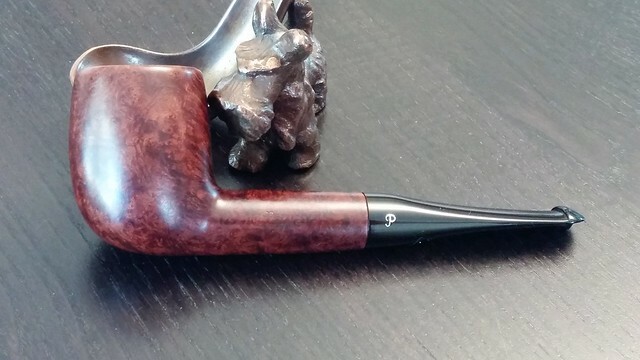 The pipe arrived in what I would call excellent estate condition – it was clean inside and out, and the rim was free of lava though not free of dents. 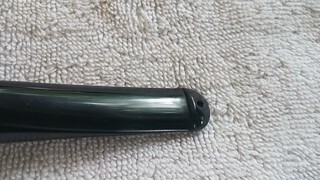 The shank was marred by what looked like tool marks top and bottom, as if someone had used a pair of pliers to twist out the stem at some point. 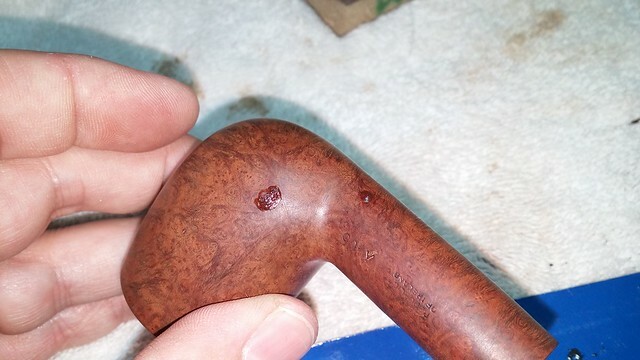 Other dents and scratches in the briar were packed with old wax that had turned white over the years. 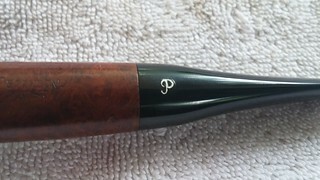 The stem was a deep black, with a pristine white Peterson “P” on the left side. 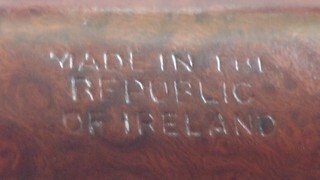 I strongly suspect that the stem is a modern replacement, though the stamps date the stummel to the period 1955-1989. 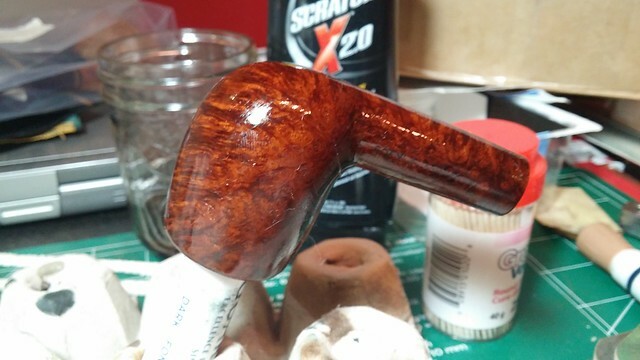 I started this refurbishment by removing the old wax finish by wiping the briar with acetone. 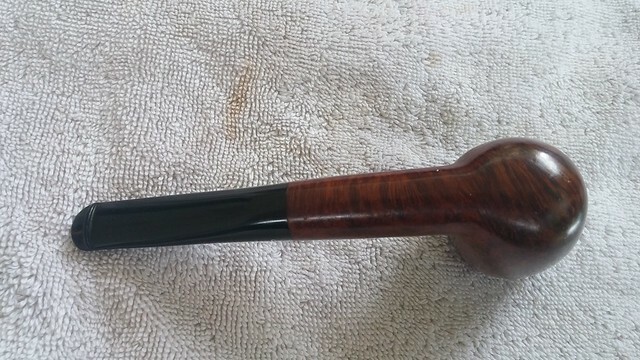 This got most of the old finish off, though I’d have to pick the old wax deposits out of both the stamps and a few dents before I got it all done. 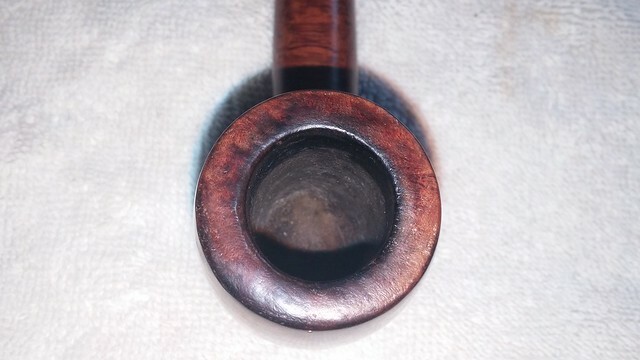 The outer rim was worn down in several places from dottle-knocking, so I topped the bowl lightly to reduce the rim damage and erase the dents and scratches on the rim top itself. 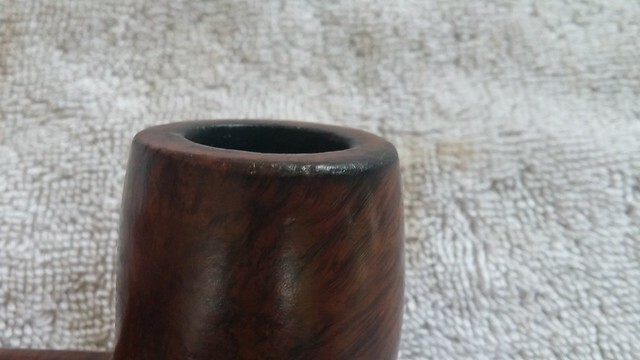 A light bit of sanding around the outer edge of the rim removed the remaining damage. Then the stummel went into an alcohol bath for a few hours to remove the last of the old finish. 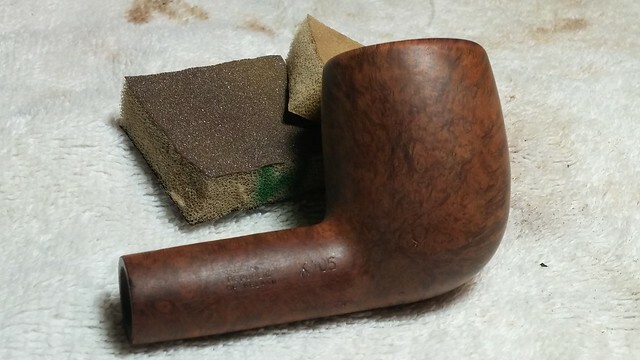 After its bath, I sanded the stummel lightly with both medium and fine grit sanding sponges. 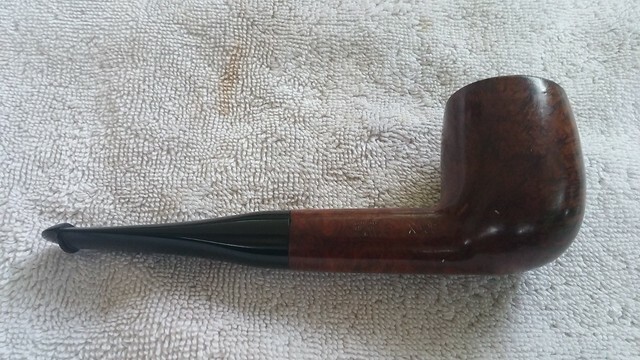 This took care of the small handling marks acquired over the years, and helped blend the rim repairs into the body of the pipe. 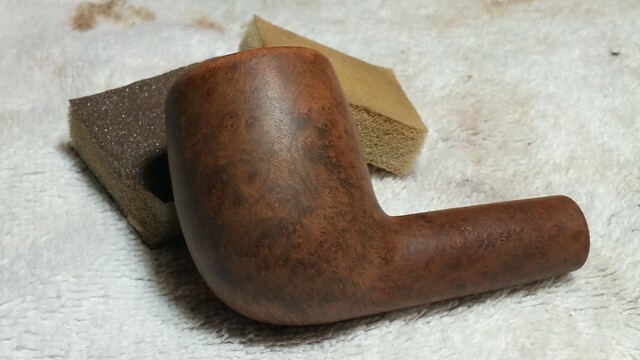 A few deep but tiny pits remained after the sanding, which I filled with a mixture of briar dust and CA glue. I also filled a small nick on the edge of the shank at the mortise. When the glue had cured, I sanded the patches flush. 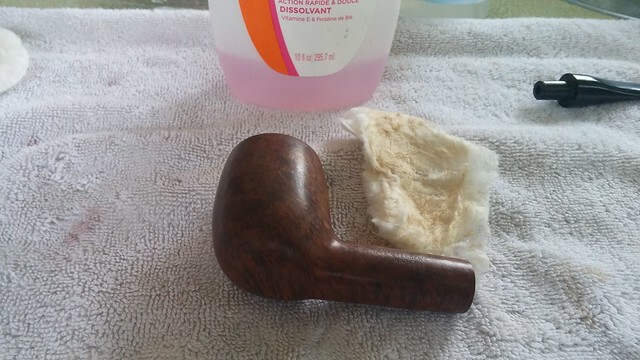 A wipe with acetone on a cotton pad pulled the sanding dust and any remaining contaminants off the surface of the briar. 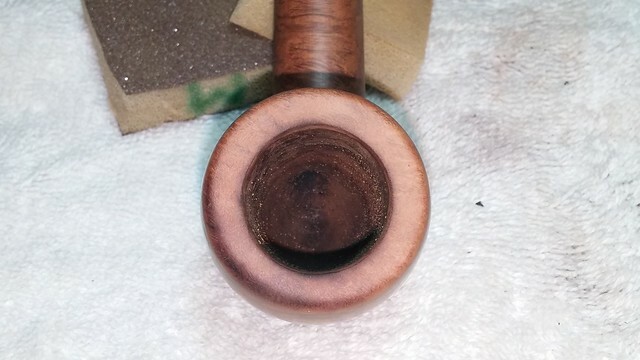 The tool marks on the shank had been reduced somewhat by the sanding, but were still quite evident. 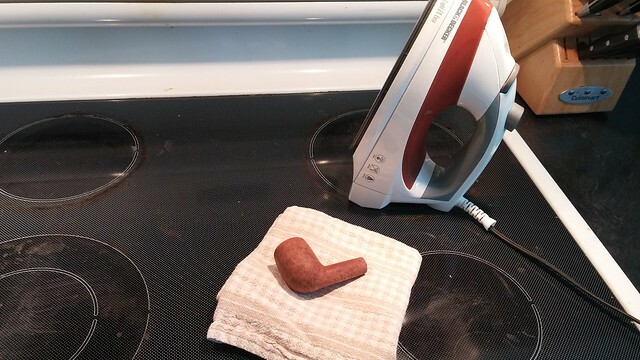 I used a household iron and a damp rag to steam the dents. The steam penetrates the wood and “fluffs” the compacted wood fibres in the dents. 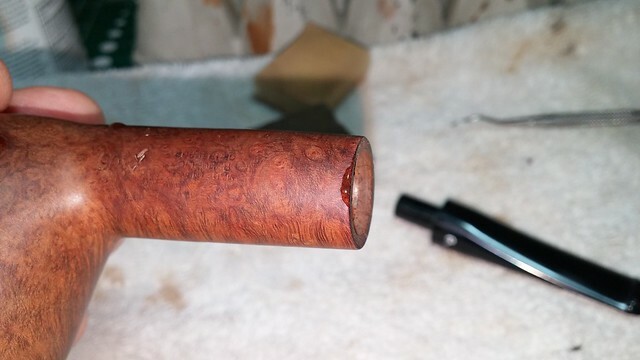 A final sanding prepped the stummel for stain. 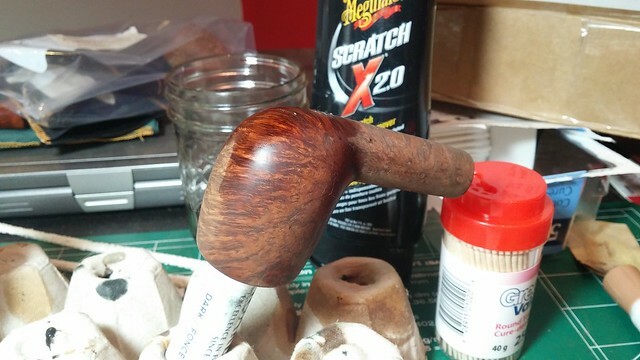 I replicated the original finish with a contrast stain of Fiebing’s Black leather dye to highlight the grain, followed by a wash of diluted Dark Brown dye. I applied the brown wash until I had the depth of colour I wanted. 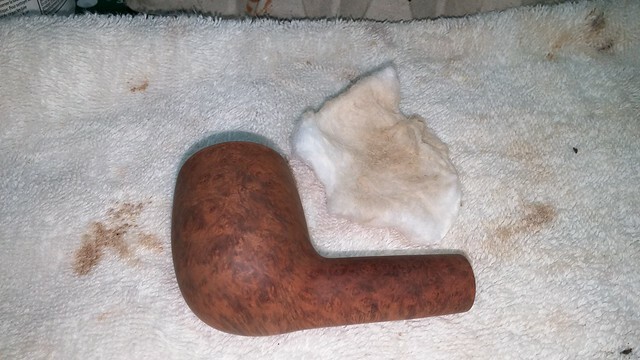 The first pic below shows the brown wash coat partially dry. 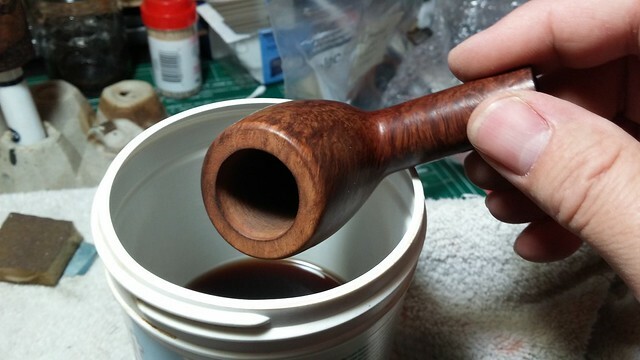 I let the stummel dry, then finished the stummel with a light wipe of mineral oil to make the grain really pop. The oil brings back the richness of the wet stain colour to the dry wood. 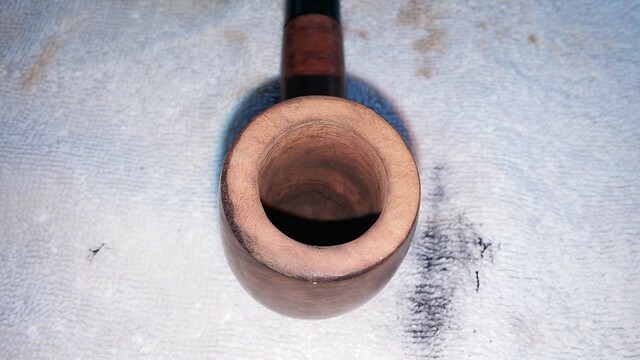 Just to make sure, I ran a few pipe cleaners through stem and stummel (the airways were clean) before going to the buffer. 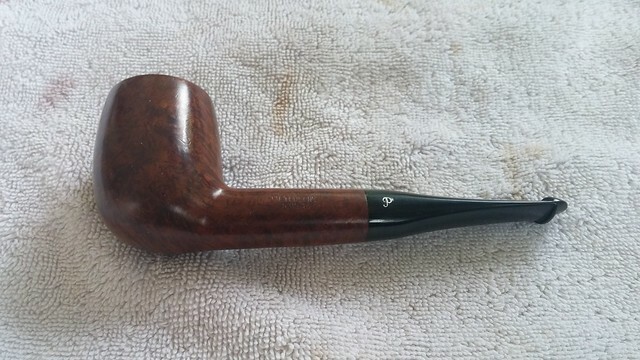 I gave the entire pipe a light buffing with White Diamond compound and several coats of Carnauba wax to shine and protect the new finish. 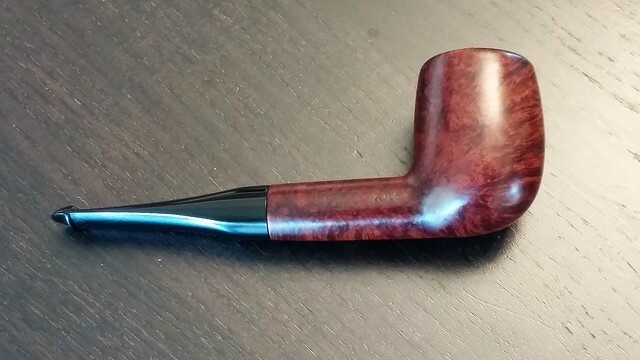 This Republic-era Kapet is ready to go back to its owner in Texas (hopefully avoiding the Caribbean en route this time). 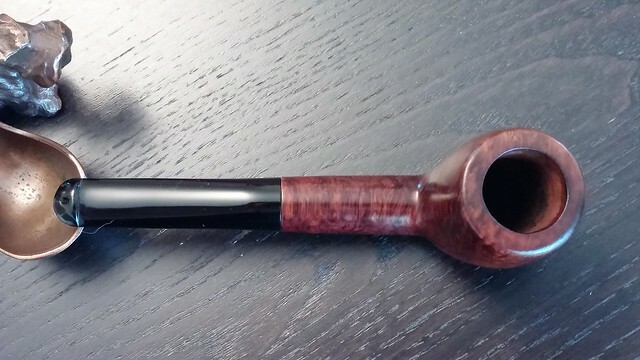 The dents and dings are gone, and though the stamps are beginning to show their age, the rejuvenated stummel mates well with the new stem, producing a smoothly-flowing shape to this classic pipe. 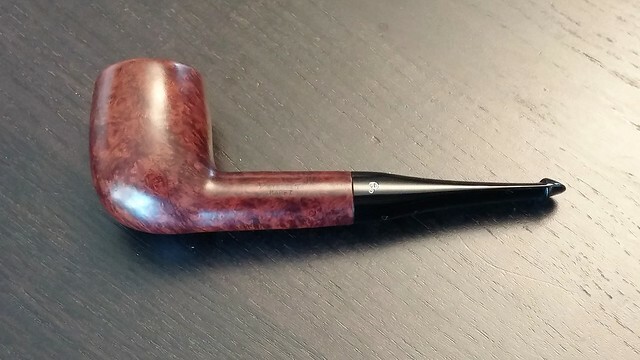 The pipe should serve its owner well for decades to come. Thanks, Al. 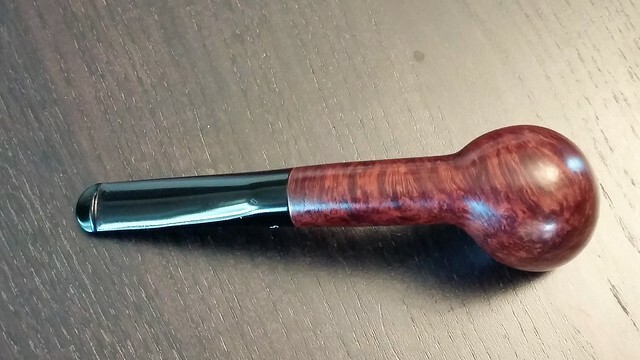 The grain is definitely showing through the finish better now that the odl layers of wax are gone. 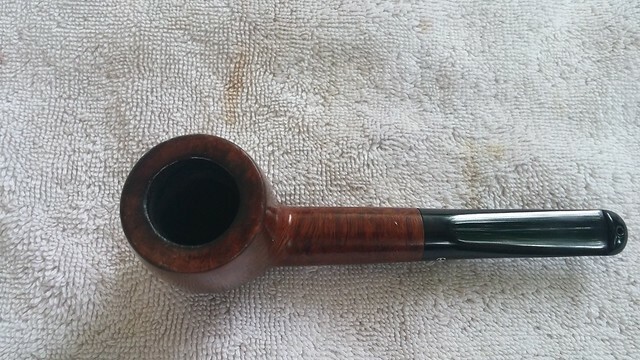 Its a nice piece of briar, especially for a less expensive Pete.